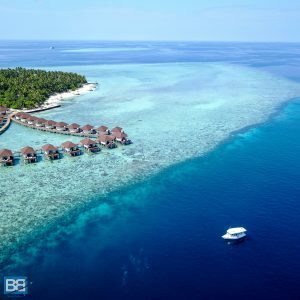 Welcome to Fulidhoo – Paradise Without The Price Tag! Having spent my first trip to the Maldives focusing on surfing (including a stay on Thulusdhoo Island and also the epic surf resort of Cinnamon Dhonveli) I was keen to get under the waves. Fulidhoo Island (pronounced “fully-do”) is in the Vaavu Atoll, just 57km (or just over an hour speedboat) from Male Airport. At only 700m x 200m and with only 200 permanent residents Fulidhoo really is all about the local island vibes – sleepy and quiet but stunning in beauty. In fact despite staying at some high end resorts during my time in the Maldives my stay on Fulidhoo was actually the highlight! Getting to Fulidhoo Island from Male is actually a pretty easy affair as it’s only about 57km away and sits just below the popular local island of Maafushi – meaning there are plenty of boats running to the area. The easiest option is the speedboat transfer and takes just over an hour and cost $40 per person. Schedule: From Male to Fulidhoo (stopping in Maafushi along the way): Sunday, Tuesday and Thursday at 10am from Vilingili Terminal in the west of Male. Tickets go on sale from 3pm the day before. There is the possibility that they can run out during high season, so if you can’t get there the day before, get there at least by 9am. The terminal is very basic, with a public toilet, but no AC. There is a café opposite though called SeaHouse Brasserie, which has AC, wifi and good food and coffee, but expect European prices. There are scheduled speedboats every day except Friday to Fulidhoo, normally at 11am but you’ll have to contact your guesthouse to book you a seat and to confirm the time, as they are subject to change. These leave from Male, normally from the jetty called Muizzu Neru, near Mary Brown Restaurant. Also Kinan Retreat (the guesthouse I stayed on the island) owns their own speedboat and may be able to arrange collection from the airport if you are staying with them. Currently there are only 8 accommodation options on the island so this is actually a rundown of them all! Kinan Retreat – Beachfront Without Budget Busting! 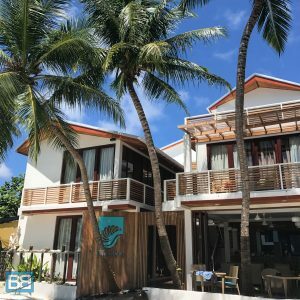 Personally when I stayed on Fulidhoo I was based out of Kinan Retreat as it was partnered with the dive centre I was scuba diving with and was ocean front and super comfortable – so it comes recommended! The main draw to Fulidhoo is the incredible scuba diving that the area has to offer – and the crew at Fulidhoo Dive have spent years scouting out the best dive sites in the area, allowing your to hit up the best scuba diving for your experience and the days conditions. 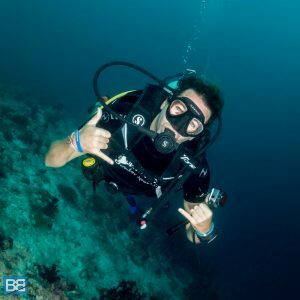 Also if you want to learn to scuba dive or further your dive experience they offer a full range of dive course – from open water and divemaster training to scuba and stay packages. 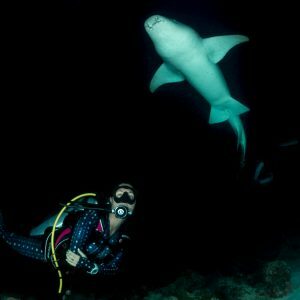 Night Diving With Nurse Sharks – EPIC! My personal favourite dive site around Fulidhoo this epic night dive is famed for the resident nurse sharks and you’ll be joined by up to 100 of these amazing sharks! 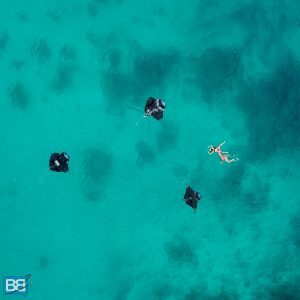 Make sure you charge your camera for this dive as you can lie right next to them on the sandy bottom for an epic dive photo! Also heaps of stingrays too. Get ready for grey reef sharks and also the opportunity for manta rays too. Best for experienced divers as medium to strong current. Resort Front Diving Without The Price Tag! Expect heaps of grey reef sharks here and some incredible soft corals, which attract lots of turtles. Keep an eye out into the blue for schools of eagles rays and even mantas. Can be strong currents but adaptable for all levels of diver. Just off of Fulidhoo Island this dive offers large, deep overhangs full of macro life and is great for a sunset or night dive. Named after the rare, black coral that covers the reef it’s the perfect backdrop for some amazing pics. With heaps of baitfish, turtles and fusiliers this is perfect year round. One of the biggest draws for experienced divers though is the fact that much of the area around Fulidhoo is still unchartered in terms of diving so exploration dives are also a possibility – with your chance to discover and name a new dive site! 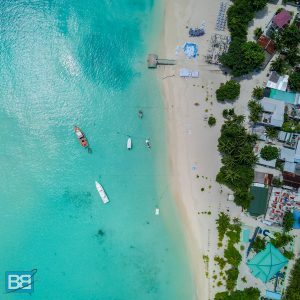 Tourist Beach – chill out at the dedicated tourist/bikini beach and top up your tan whilst swimming in the clear waters of the lagoon, perfect for relaxing on the cheap! Manta Rays Are One Of My Faves! Why Not Chill Out On A Sand Cay?! 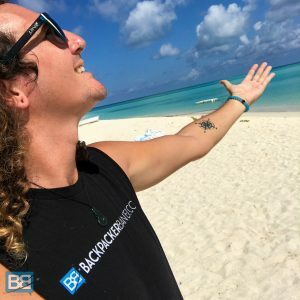 Stingray Feeding – I’m on the fence about how I feel about this one. Originally local fishermen used to throw their scraps to the stingrays so they came in close to shore for a free meal. Now its a nightly thing more aimed at tourists. If you do go and watch it please just don’t touch them! Scuba Diving – ok so this was meant to be the non diving section – but seriously get into the big blue, even if it’s your first ever time! 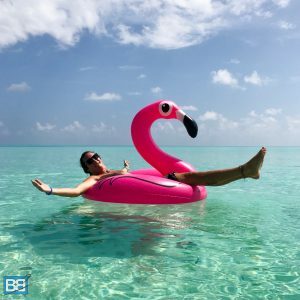 Day trip to luxury resort – for those who want to sample the luxury lifestyle you can do a day trip to some of the surrounding resorts which include food and even alcohol. A great way to sample paradise without a huge price tag! 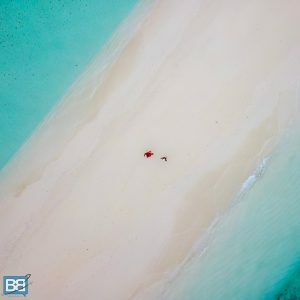 Fulidhoo is actually a pretty reasonably priced island to stay on in the Maldives – and it’s not going to cost you anywhere near what a luxury resort would! That being said the budget you’ll need for the Maldives is really going to depend on what style of accommodation you want. Blue Waters, White Beaches and Palm Trees – Perfection! How Good Does That Water Look?! The high season of December to April is the best time to visit for scuba diving, with great visibility, good currents and dry weather. But during low season there can be weeks of dry weather, and because you can reach both the east and west of the atoll from Fulidhoo – depending on the wind, you can always find good diving. For non divers low season is a also a great option as room rates are cheaper and the island is very quiet – so its the perfect time to escape the crowds. As for how long to stay – well I stayed 6 days and it was perfect. For scuba divers obviously the more time you stay the more amazing dives you can fit in. For non divers though fitting in Fulidhoo as part of a longer island hopping itinerary is a good way to go, but I’d still leave your 4-5 night minimum, especially if you have long travel days to/from your previous/next destination. Ultimately if you want to chill out, relax and enjoy island time Fulidhoo is an amazing spot to unwind! **IMPORTANT** – ATMs: A big thing to stress about the island (and a lot of the local islands actually) is there is NO ATM/cash machine, so you need to come prepared! Also (and even more annoyingly) a lot of hotels and guest houses don’t accept card either, so you need to make sure you grab a good chunk of dollar from the airport on arrival! You’ll find: a health centre, a school, community centre, mosque, shops, cafes, guesthouses. Food options: You can either eat in the guesthouses, which will offer a mix of local and foreign dishes, or in the 2 local cafes, which offer fried rice/noodles and curries. In the shops you’ll find ice creams, local fruit (bananas, papaya, watermelon, apples, oranges), biscuits, bottled water, crisps, soft drinks, nuts and nice chocolate. Wildlife: large fruit bats, herons, and lots of stingrays in the jetty. Internet: There is wifi in the guesthouses but it might be a bit weak. Buy a sim from the airport instead if you’re going to need to be online! 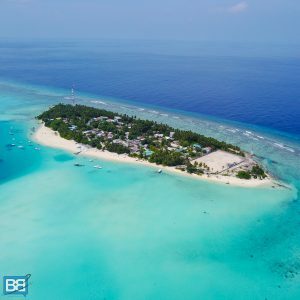 Massive thanks to the guys at Fulidhoo Dive for their contribution to this post and for double checking all the info I compiled! Have you hit up Fulidhoo for scuba diving or simply exploring? Great article, thanks ! We will be visiting January 19-23, 2019. When you say : “so you need to make sure you grab a good chunk of dollar from the airport on arrival!”, do you mean getting local currency from an ATM at the airport ? Or getting US dollars at the airport ? If so, how ? Yeeeewwww stoked to hear you’re heading that way Louis!